Another week of dynasty fantasy football recap for you nerds. I clearly pissed off the fantasy gods after week one as many of my 1-0 dynasty teams turned into .500 teams very quickly. 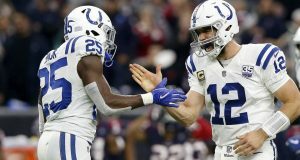 Regardless it was an enjoyable weekend watching football and I’m here to deliver my five takeaways from week two for my fellow dynasty nerds. Hopefully, my readers didn’t experience the bad luck I did in week two and can continue racking up those wins in their leagues. Enjoy this week’s breakdown and as always thanks for reading. This will never, not be my favorite topic to cover. I have a passion for the “Zero RB’ crowd and although I don’t use this strategy in as many leagues as I used too it’s still something I love to talk about. 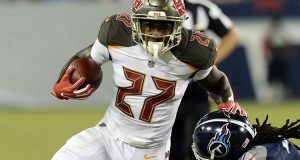 After week two there are only six RBs with two RB1 finishes (Gurley, Kamara, Melvin Gordon, Saquon Barkley, James Conner, and Chris Thompson). Chris Thompson who is probably the biggest outlier of this group has averaged over 15 PPR fantasy points per game in eight of his last 11 games he’s been healthy and has averaged 16.5 fantasy PPG in that span. Through two weeks 38 players are on pace for 1,000 yards receiving and four of those players are RBs (McCaffrey, Kamara, Thompson and Melvin Gordon). In fact, if you were just to use Melvin Gordon’s receiving stats he is on pace to finish as WR10. The passing numbers are up in the NFL to start the season as we’ll cover later but it’s evident that at least early on it’s the year of the receiving back. Currently, four RBs rank in the top 25 in target market share according to Pro Football Focus (McCaffrey, Barkley, Gordon, and Thompson). Thirteen RBs with over 40% of their teams total touches with eleven RBs currently on pace to rush for 1,000 yards. Of those RBs on pace for 1,000-yard seasons, seven of them are either in a committee or are projected to have competition by seasons end. Two of the biggest dynasty assets at RBs in the past two seasons have been Christian McCaffrey and Alvin Kamara and the stats back it up. Since being drafted in 2017 CMC and Kamara rank 1st and 2nd respectively in targets for RBs and would rank 14th and 27th for WRs according to PFF. Rushing totals and rushing touchdowns are bound to pick back up as the season goes on and the weather gets worse. For the foreseeable future, the receiving backs seem to have a huge leg up in fantasy points in the early part of the season. This was brought up to cover the head-scratching usage of a few players I’ve noticed the first two games. Now I totally understand that this is such a small sample size and it’s not the time to panic or anything but there is a little cause for concern here. First up is Kareem Hunt yes the 2017 NFL rushing leader. While the Chiefs rank number one in PPG in the NFL after two games it seems like Kareem Hunt has been the forgotten man in Kansas City. The Chiefs are on this insanely unsustainable college like spread offensive pace so not many people are complaining. Hunt’s usage is alarming even more so because the Chiefs are yet to play from behind in the first eight quarters of the season. In both games on the road so far in 2018 Hunt has failed to total 20 touches in either contest. Hunt also only has one target on the season in an offense that is clearly pass happy. 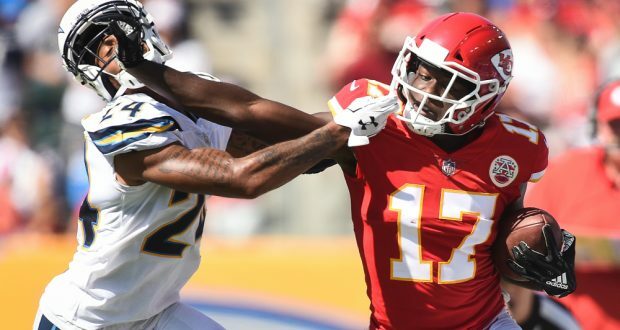 While the Chiefs continue to feature the insanely talented Tyreek Hill and stud TE Travis Kelce they also added Sammy Watkins in free agency in the offseason. Hunt did score on his only target of the season from Patrick Mahomes but his rushing attempts and targets need to pick up soon. Remember this is a guy some owners are relying on as an RB1 this season. Hunt’s numbers will come around but this Chiefs offense is supremely talented his early season usage could be very concerning without more red zone chances in the coming weeks. We shift our focus to star RB David Johnson of the Arizona Cardinals. This has been a topic of conversation all over Twitter this week so I figured I would mention a few stats and give my two cents on the situation. I’ll start with the fact that I don’t believe Mike McCoy is competent to run an NFL offense in 2018 but here we are. The Arizona Cardinals are dead last in the NFL in plays run, PPG, YPG, first downs per game and red zone drives per game. Johnson has 28 touches this season averaging only 14 touches per game while in his monster 2016 season he averaged over 23 touches per game. DJ made his name mostly in the passing game and specifically as a WR. Johnson saw 41% of his routes ran flexed out wide as I mentioned last week while only being flexed out 11% of the time this season. This is more alarming because the Cardinals have been behind for all eight quarters of the 2018 season. Cardinals head coach Steve Wilks while criticized about this topic this week supported his O.C Mike McCoy and admitted how talented DJ is and they have to come up with a game plan to get him the ball more. I’m afraid without a QB change this gets worse before it gets better, unfortunately. Hang in there dynasty owners this has to turn around eventually just stay afloat until we get there. This last player I bring up is Nick Chubb now I know it’s way too early to panic on a rookie RB but it’s worth talking about. Chubb was far too expensive for me in rookie drafts I wasn’t willing to pay the price he cost after being drafted 35th overall by the Browns in the 2018 NFL draft. Chubb Has seen a total of seven snaps in two games and had five total touches. The Browns have two RBs in Hyde and Duke Johnson over him but specifically with game flow, there’s simply no reason Chubb hasn’t seen more playing time. Hyde has seen over 70% of his teams backfield touches in both games this season. I know most dynasty owners predicted Carlos Hyde to be moving on after 2018 and Chubb to step in as the feature back with Johnson playing the passing game role. This doesn’t look like the case in both games Hyde has scored a red zone TD. Chubb may be a hail mary play unless Hyde is hurt at some point this season. I can’t complain about his usage at this point because he’s not even being used. Taxi squad might be the way to go with Chubb until he gets more playing time. This is a shorter talking point but one that we need to discuss. NFL offenses are back through the first two games and dynasty owners couldn’t be much happier. So far there have been 37 more passing touchdowns and 4 more rushing touchdowns than this time last year. The quarterback play has been simply insane in week two NFL QBs averaged 102.6 passer ratings and 278.6 yards per game. 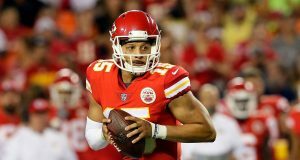 The talk of the dynasty community has been the starts of veteran Ryan Fitzpatrick and second-year QB Patrick Mahomes. Fitzpatrick has nine touchdowns and Mahomes with ten through two games. Ryan Fitzpatrick’s 72.3 fantasy points and Mahomes 67.2 fantasy points are the top two starts to a season all time. I’ve touched on it already but passing offense has been way up in 2018 and with the NFL defensive rules being implemented every year to protect QBs at all costs I only see these numbers becoming more normal. In 2017 eight teams averaged 25 PPG or more in 2018 12 teams are on pace for this with seven on pace to average at least 30 PPG. Superflex leagues are probably affected most by this bump in passing offense while QBs were already hard to acquire in those leagues this definitely makes the values of those players increase even more. This will join the RB report and be included in every article this season. Speaking for myself this is the easiest way to predict fantasy points going forward. Numbers don’t lie and if you are getting targets you have more opportunities to catch passes and produce fantasy points it seems simple right? Five takeaways from the target leaders list I put together for you guys. Antonio Brown (16.5) and Juju Smith Schuster (13.5) rank in the top five of targets per game. All three Lions WRs average over 8.5 targets per game. Golden Tate 4th in the NFL with 14 per game. Zach Ertz averaging 11.5 targets per game the next closest TE is Travis Kelce with 8. The Giants offense – OBJ (12), Saquon Barkley (11), Evan Engram (6) and Sterling Shepard (6) targets per game. Eli Manning on pace to finish as QB26. K.C Chiefs rank first in PPG. Kelce (8), Tyreek Hill (7), Sammy Watkins (6) targets per game. Patrick Mahomes has 10 touchdown passes in eight quarters. WR always seems to be the deepest position in dynasty leagues year after year. There are a few targets I like and recommend putting together offers for if you are looking to acquire depth or even starters. I do realize the price point on a few of these guys has increased quite a bit in the last two weeks but that shouldn’t stop you from trying to acquire them. First and most expensive is Kenny Golladay the young Lions WR. Golladay has 13 receptions for 203 yards and a touchdown in two games. After playing the most snaps of any of the Lions WRs in week one he followed it up by playing 96% of snaps in week two while going 6/89/1 on nine targets. Golladay is also fourth in air yards of all WRs in the NFL behind only Julio, A.B and Hopkins. Golladay might cost you some major capital but I’m all in on him breaking out in 2018. The rest of these guys should be far easier to acquire in dynasty leagues. Antonio Callaway is my next guy he was drafted with a troubled past at Florida but with the surprising trade of Josh Gordon it makes Callaway easily become the WR2 on the Browns. In week two without Gordon, he saw 3/81/1 stat line. Jarvis Landry is the guy in Cleveland but Callaway could see a huge spike in targets in Todd Haley’s offense as a rookie. Quincy Enunwa is next on my list. Enunwa after sitting out all of 2017 with an injury has come back to a bad Jets offense and received 33% of the target market share. Only four WRs (Julio, Michael Thomas, Hopkins, and Corey Davis) have higher shares according to PFF. Enunwa has also seen 21 targets on 62 total pass attempts from rookie QB Sam Darnold. Enunwa is playing a TE type role for the Jets in 2018 and he’s a PPR monster if he continues this play. My last WR buy is Will Fuller who as long as you can deal with his lingering soft tissue injuries is a good buy. Since Deshaun Watson took over as the starter he has six touchdowns in five games. In games, Fuller has played Watson has averaged over 35 fantasy points per game and only 17 in games Fuller has missed. Fuller isn’t going to light up PPR leagues by any means but he is a touchdown machine in the Texans offense and he gets an insane amount of off coverage playing in the same offense as DeAndre Hopkins. Fuller may be a bit pricey depending on the owner but he’s a guy I’m buying if I need a low-end WR2 or high-end WR3. That’s it again for this week nerds. As always any suggestions are welcome and I truly appreciate everyone who enjoys and supports the series I have put together for dynasty nerds. I’ll be with you all year as we try to win as many dynasty championships as possible. Good luck this week!